KIMBERLY, Wis. — "Experience" was the key word the Kimberly Papermakers used to evaluate their biggest strength in 2019. And after five consecutive trips to the WIAA state tournament — including winning the Division 1 crown in 2017 — the fact that Kimberly returns its entire team from last season puts the Papermakers in prime position to play for another gold ball this season. "Some great senior leadership in 2017,” said coach Ryan McGinnis. “A lot of these guys were sophomores at that time, and it took them a little while to pick up that leadership role last year and I think this year they have a much better grasp of what it takes to kind of be that older guy and kind of take those younger guys in and set the tone of what the details are and what the expectations are." 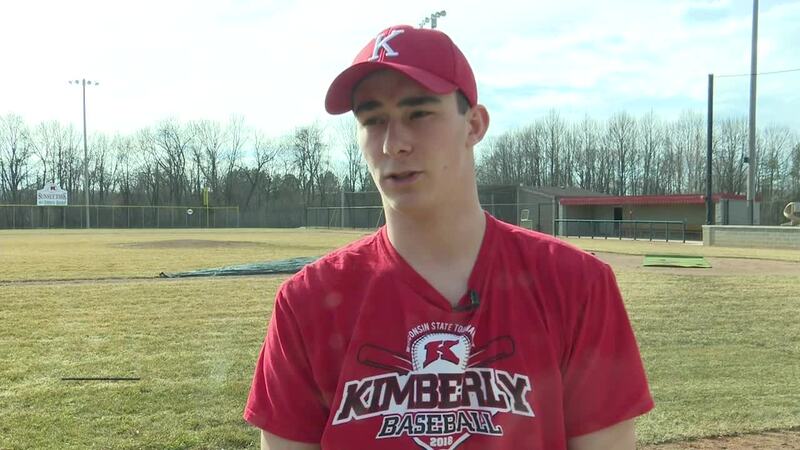 "I think we've got a lot of experience,” said Zach Lechnir, one of 11 seniors for Kimberly this season. “So a lot of us played on that state championship run when we were sophomores, so we've got a lot of experience and know what it takes to get to Fox Cities Stadium." Lechnir figures to be a big part of that equation, after the shortstop batted .387 and stole 15 bags last year. His twin brother, Drew, is an outfielder who hit .306 with 21 RBI and stole 14 bases. Another key senior, catcher Beau Schumacher, earned third team All-Wisconsin accolades in 2018 with a .440 batting average and 48 RBI. "I mean obviously just having as many seniors as we do is going to play to our advantage, just leadership-wise and just athletic ability and talent-wise,” he said. “So that should be one of our strengths is just kind of be comfortable with each other as a team just because we've been together for four years now obviously." "We've all been together four years now and we all know each other,” said John Nett, an All-Wisconsin honorable mention a season ago after hitting .457. “We know where each other is going to be, we know each other's calls and that ultimately leads to the best team is knowing your teammates and being there for each other."